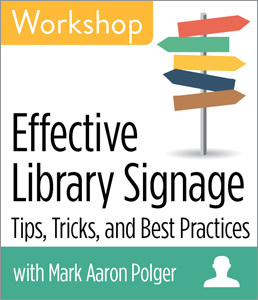 CHICAGO—ALA Publishing eLearning Solutions announces a new session of our popular workshop, Effective Library Signage: Tips, Tricks, & Best Practices with Mark Aaron Polger. This workshop will last 90 minutes and take place at 2:30pm Eastern/1:30 Central/12:30 Mountain/11:30am Pacific on Wednesday, July 11, 2018. Library signage represents the first lines of communication between a library user and the library. Are you doing everything to ensure that your signage is user-friendly and inviting? Although we have the best intentions, sometimes our signage can be punitive, contradictory, outdated, or passive aggressive. In this workshop, Mark Aaron Polger provides you with the top ten tips to follow when preparing new signage for your library. Polger, a library professional at the College of Staten Island, CUNY, conducted a library signage audit in 2012 and continued this project. He has conducted both quantitative and qualitative assessment of signage design, placement, branding, message, and in 2017, he conducted interviews on students’ perceptions of library signage. He discusses what constitutes “bad” and “good” signage and the importance of developing a signage policy to ensure consistency in design and overall language. Other topics that will be addressed will be placement, ADA compliancy, branding, design, verbiage, and the use of images, language, and font. You’ll come out of this workshop with the best practices to assess your current signage and develop improved signage for your institution. Mark Aaron Polger is Assistant Professor/First Year Outreach Librarian at the College of Staten Island, City University of New York (CUNY). His responsibilities include promoting library services and resources to first year students and teaching the Information Literacy course (Beyond Google) in the department. Polger's research interests include library marketing, outreach, and user experience design. He has written and presented on topics ranging from library marketing strategies, faculty outreach, Information Literacy outreach, embedded librarianship, library jargon, and library signage. Polger holds a BA in Sociology from Concordia University, an MA in Sociology from the University of Waterloo, a B.Ed. in adult education from Brock University, and an MLIS from the University of Western Ontario. He is starting his third year at SUNY University at Buffalo, where he is pursuing his Ph.D. in Curriculum, Instruction, and the Science of Learning.